The Columbia River Gorge never lacks for things to see and do and a favorite to locals and visitors alike is Skamania Lodge, which has recently gone through a bit of a renaissance. Luckily for those who like things a little on the wild side, this renaissance includes luxury tree houses set within the folds of the forest. According to Director of Sales and Marketing, Todd Gillespie, this first set of tree houses, designed by tree house expert Dave Nelson, will be the first of several tree house villages at Skamania Lodge. Each tree house sits about 15 -20 feet above the forest floor. 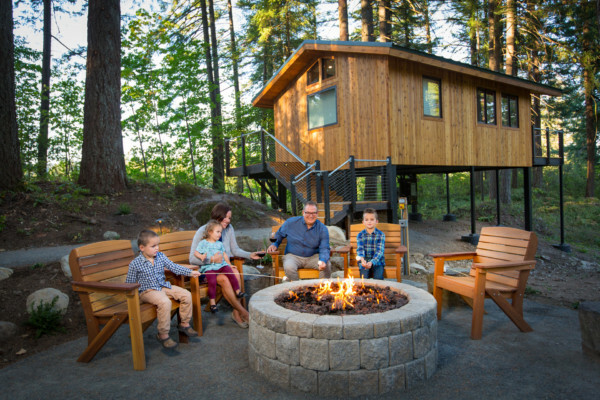 The stark contrast of the knotty pine exterior with the canopy of the surrounding trees calms the senses the moment it is experienced and you can feel relaxation overtaking stress. Each tree house has a large deck with big red rocking chairs and a fire pit. Once inside you will find the tree house to have a refined rustic feel. With hardwood floors, a 50” smart TV and a king sized bed; you will find all the luxuries Skamania Lodge is known for with the added touch of being closer to nature. Lots of windows let in natural light throughout the day. A black slate floor full bath will be a welcome sight at the end of a strenuous day of golf at Skamania’s award winning golf course. The tree house will sleep four, but it was meant for two. The romantic setting is great for couples on their honeymoon or anniversary. In addition to the new tree houses the guests rooms in the lodge have been updated with new mattresses, linens, pillows, large TV’s, artwork, toiletries, draperies and carpeting. New carpeting has also been placed in the corridors. Skamania Lodge was built in 1993 and is reminiscent of the great American lodges of the early 1900’s. The lodge is four stories and within its walls are accents of timber, wood paneling, native stone and wrought iron. The lodge itself has many stories to tell. In the Gorge Room are large timber columns, which are more than 100 years old. All of which came from the Bumble Bee Foods cannery in Astoria, Oregon when it was being torn down. The Gorge Room floor came from Georgia and is Southern Longleaf Pine. It was reclaimed from a 150-200 year old building. The lobby floor is Montana slate. The fireplace stone was excavated from a nearby abandoned quarry. The petroglyph artwork that adorn the walls throughout the lodge are from rubbings of Native American artwork found on stones in the Columbia River Gorge, many of which are now submerged in the depths of the Columbia River. Skamania Lodge is the largest employer of the county with over 300 employees during peak season. With more than 22,000 square feet of meeting space, T-1 and high speed internet access, as well as 23 IACC approved meeting rooms and in-house audio and visual capabilities, the conference center as Skamania Lodge is sure to fill the needs of conference organizers large and small. As if of this were not enough, there is still more to what makes Skamania Lodge a destination resort. Dry saunas, four hot tubs, an indoor swimming pool and the Waterleaf Spa will be sure to fill up any extra time you may have. Skamania Lodge also provides several dining choices during your stay, one of which is The Cascade Dining Room. It offers a breathtaking view of the Columbia River Gorge and is open seven days a week and offers a variety of choice to fit everyone’s appetite. From salmon to smoked pork loin, prime rib to their Sunday Champagne Brunch, dining in the Cascade Dining Room will be an experience to be remembered. Of course there is plenty to do outside while at Skamania Lodge. The challenging 18-hole, par-70 golf course features a driving range, a practice bunker, chipping greens and putting greens. There is a full-service golf shop where rental equipment is available as are a staff of PGA Professionals to assist you if needed. In addition to golfing, there are plenty of opportunities to hike on the Skamania Lodge property or the nearby Columbia River Gorge area. The Gorge has more than 50 hiking trails, the most popular being the Pacific Coast Trail which spans from Mexico to Canada. Beacon Rock is also a favorite among hikers. It is the second largest monolith on the northern hemisphere and stands 848 feet tall. A trail winds its way to the top. And for those who need a little more adventure than a quick round of golf there is zip lining at Zip the Gorge zip line tour. With seven zip lines, three sky bridges and a belay station adventure is the name of the game. Take in the beauty of the Columbia River Gorge as you zip through a canopy of fir trees, suspended by a single cable. Zip lines range from 100 feet to over 800 feet in length. Skamania Lodge offers guests an experience of a lifetime, whether you enjoy golfing, hiking, relaxing or a little zip lining, there is something for everyone at Skamania Lodge.